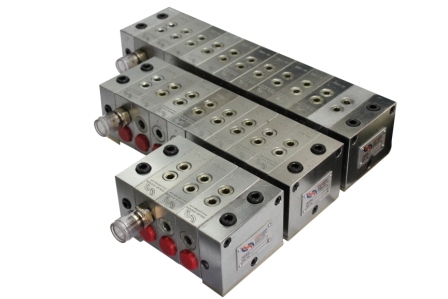 Series 6080 are the Modular Range Progressive Blocks. They are similar to Series 4555 except that they are bigger in size and output. They consist of a Starting Block, an End Block and Middle Blocks (Max 11). The uniqueness of this series of blocks is the flexibility in terms of output per outlet which can be achieved by varying the middle block configuration. The combinations in terms of outlets and output which can be achieved by using these blocks are in thousands. The below mentioned list are just the standard models. Please contact us with your exact requirement for the most suitable model.